Even in Copenhagen there are examples of an ongoing Arrogance of Space. Bizarre but true. Even here we are still battling to reverse decades of destructive urban planning at the misconceptions that came along with it. 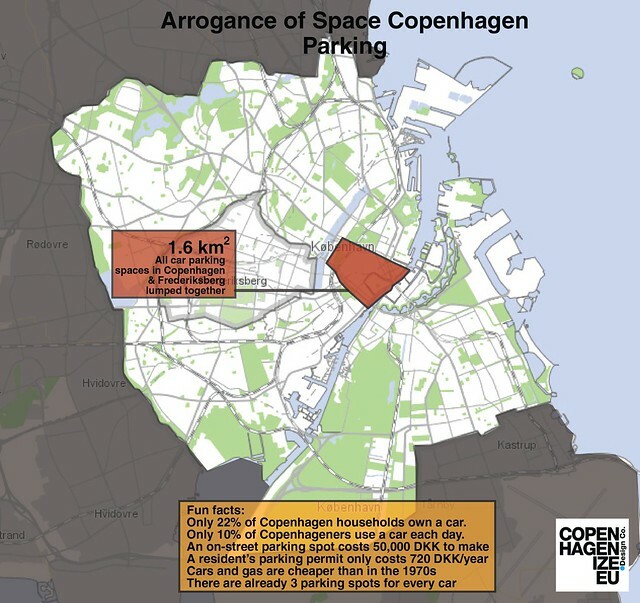 In Copenhagen, only 22% of households own a car. No, not because it's expensive and there is a high tax on cars. The rednecks in the provinces buy them all the time and both cars and gas are cheaper than in the 1970s during the oil crises. Only 10% of Copenhageners use a use a car to get around each day. 63% ride a bicycle. The rest take public transport or walk. It costs 50,000 DKK (ca. $8000) to make a parking spot and maintain it. But a parking permit for residents only costs 720 DKK (ca. 110) per year. That is bad business. The non-motoring majority are basically subsidizing a destructive, archaeic transport form used by a old-fashioned minority. Nevertheless, there are still three parking spots for every one car in Copenhagen. Despite the logic and the numbers. The current Lord Mayor Frank Jensen - in an attempt to appease the right-wing who only have car parking to fight for anymore in the City of Cyclists - insists on putting back in parking spots for phantom motorists. 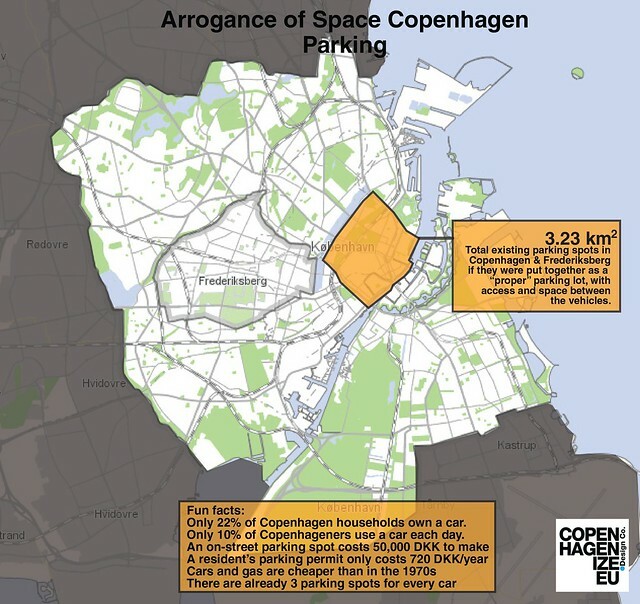 In the graphic, above, you can see what it would look like if we took all the car parking spots in Copenhagen and Frederiksberg and slapped them together. In this graphic, we can see roughly how much space a parking lot featuring all the parking spots would require - if we provided the necessary extra space for access and what not. You know, driving into the lot and finding a spot, etc. Almost the entire city centre of Copenhagen would be paved over. 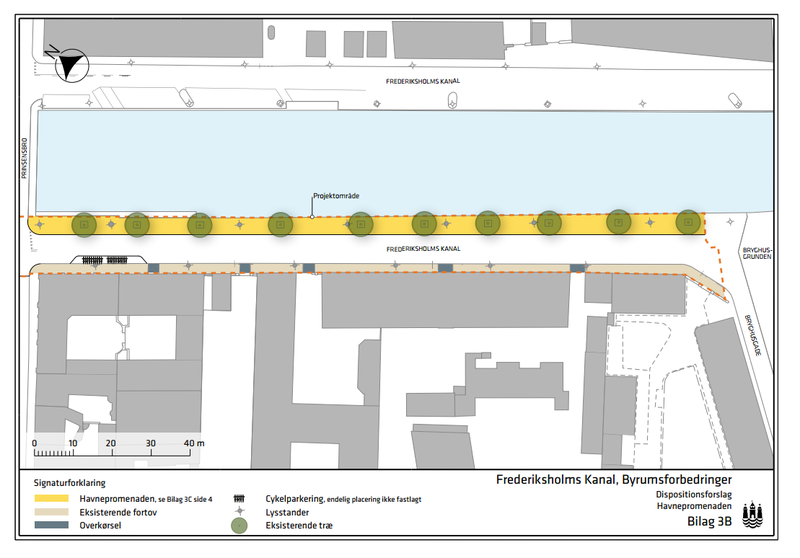 The news this morning in Copenhagen that the City is removing 80 car parking spots along the historic Frederiksholm Canal is great to wake up to. 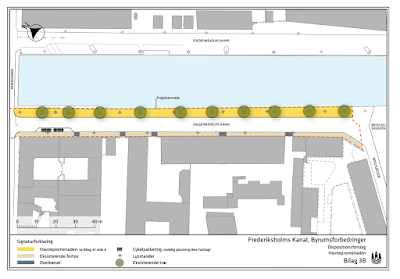 The City will be making a promenade along the canal to create better public space. Fantastic. At the moment it feels like you are stuck in the mid-60s along this stretch so this improvement is much welcomed. Read more about the project - in Danish - on the City's website. 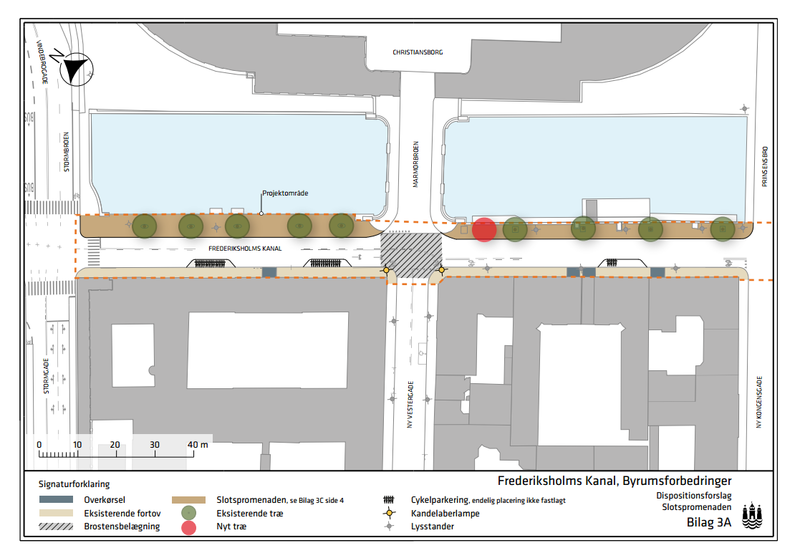 By and large, there are constant improvements for public space and bike infrastructure on the go in Copenhagen. Missing links are being fixed and small but effective examples of Reversing the Arrogance of Space are showing up on the streets of the city. As we can see in the graphics at the top, however, there are more pressing issues that require bold, political leadership if we are seriously going to modernise for the next century of transport.